Eye Creams: Devita, Barefoot SOS, Lotus Aroma, Mad Hippie, Burts Bees! • Under Eye Repair Serum: Under eye 911! Dark circles - they can be a face emergency and they are often just a result of inadequate circulation to the fine and delicate under eye tissues. Made with Vitamin K to help reduce the look of dark eye circles by encouraging circulation, Hesperidin for increased moisturization, and Astaxanthin for powerful anti-oxidant protection. This serum also helps to reduce the appearance of puffiness, fine lines, and wrinkles. It is the perfect under eye 911 treatment for for intense hydration to the eye area. For external use only. 0.5 oz. ORDER TODAY! Ingredients: Aloe Barbadensis (certified organic aloe vera gel), Camellia sinensis (Japanese green tea) leaf extract, Euphrasia officinalis (eyebright) extract, Tocopherol (vitamin E), Zinc oxide, Retinol (vitamin A), Hesperidin methyl chalcone (derived from citrus fruit), Haematococcus pluvialis (astaxanthin) extract (derived from microalgae), Phytomenadione (vitamin K), Hydroxymethylcellulose (plant source), Potassium sorbate, Vitis vinifera (grape) seed extract. • Revitalizing Eye Lift Creme: Rich, nurturing Revitalizing Eye Lift Creme helps increase new collagen and elastin production and support cellular repair. This calming, smoothing creme serum helps reduce the look of puffiness and dark circles, while adding needed moisture. Revitalizing Eye Lift Creme is the perfect under eye treatment offering to be gentle on the delicate muscles and tissues surrounding your eyes. For external use only. 30 ml. ORDER TODAY! Ingredients: Aloe Barbadensis (Certified Organic Aloe Vera Gel), Capric/Caprylic Triglycerides (Derived From Coconut), Butyrospermum Parkii (Shea Butter), Hyaluronic Acid (Vegan Source), Hydrolyzed Collagen (Plant Source), Palmitoyl Oligopeptide-Palmitoyl Tetrapeptide-3, Anthemis Nobilis (Chamomile) Flower Seed Extract, Euphrasia Officinalis (Eyebright) Extract, Squalane (Olive), Panthenol (Vitamin B5), Phytomenadione (Vitamin K), Retinol (Vitamin A), Beta Glucan (derived from oats), Tocopherol (Vitamin E), Vitis Vinifera (Grape) Seed Extract, Citrus Paradisi (grapefruit) seed extract. FACE CARE: Under Eye Repair Serum, 0.5 oz. FACE CARE: Revitalizing Eye Lift Creme, 1 oz. • Soothing Eye Cream:Soothing Eye Cream is made with Rosehip and Borage Oil to gently reduce puffiness and diminish fine lines around your eyes. Boswellia extract calms and refresh the skin around your eyes, and Vitamin E protects against environmental stress. Encourages healthy cell restoration to maintain skin's youthful look. For external use only. 0.5 oz. ORDER TODAY! Ingredients: Aqua, Aloe Barbadenis Leaf Juice, Sunflower Oil, Glycerin, Capric Caprylic Triglycerides, Shea butter, Isopropyl Myristate, Myristyl Myristate, Stearyl alcohol, Glyceryl Stearate Citrate, Cetyl Alcohol, Glyceryl Stearate, Squalane, Magnesium Ascorbyl Phosphate, Tocopherols, Flax Seed Oil, Modified Corn Starch Prunus Persica (Peach) Leaf Extract, Borage Oil, Panthenol, Rosehip Oil, Soy Lecithin, Hyaluronic Acid, Boswellia Serrata Extract, Tocopherol Acetate, Phenoxyethanol, Ethyl Hexyl Glycerin. • Reviving Eye Cream: Reviving Eye Cream is made with Rosehip and Borage Oil to gently diminish puffiness and reduce fine lines around your eyes, antioxidants Amla Extract and Vitamin E helps protect against environmental stress. Moisturizes and rejuvenate the skin around your eyes. Encourages healthy cell renewal to maintain skin's youthful look. For external use only. 0.5 oz. ORDER TODAY! Ingredients: Aqua/Water/Eau, Aloe Barbadenis Leaf Juice, Sunflower Oil, Glycerin, Capric Caprylic Triglycerides, Shea Butter, Isopropyl Myristate, Myristyl Myristate, Stearyl Alcohol, Glyceryl Stearate Citrate, Cetyl Alcohol, Glyceryl Stearate, Squalane, Magnesium Ascorbyl Phosphate, Tocopherols, Flax Seed Oil, Modified Corn Starch, Borage Oil, Panthenol, Rosehip Oil, Soy Lecithin, Hyaluronic Acid, Ethylbisiminomethylguaiacol Manganese Chloride (EUK-134™), Emblica officinalis (Amla) Extract Tocopherol Acetate, Phenoxyethanol, Ethyl Hexyl Glycerin . FACE CARE: Eye Cream, 0.5 oz. • The Eye Gel: The Eye Gel is as cool as a Cucumber with a gentle tingle. Made with Hyaluronic Acid, Cucumber and Periwinkle are invigorating Collagen to help refine the appearance of fine lines and repairing elasticity and firmness to the skin around the eyes. For external use only. 0.5 oz. ORDER TODAY! Ingredients: Organic Herbal Blend, Organic Aloe Vera Leaf Juice, Cucumber Hydrosol, Organic Jojoba Oil, Botanical Hyaluronic Acid, MSM - Methylsulfonylmethane, Hydroxyethyl Cellulose, Irish Moss Extract, Silk Protein Amino Acid Blend - Sodium L-Pyrrolidone Carboxylate, Sodium Lactate, L-Arginine, L-Aspartic Acid,L-Pyrrolidonecarboxylic Acid, Glycine, L-Alanine, L-Serine, L-Valine, L-Proline, L-Threonine, L-Isoleucine, L-Histidine, L-Phenylalanine, Wildcrafted Periwinkle, Organic Licorice, Vitamin E, Sodium Benzoate, Potassium Sorbate, Ethyl HexylGlycerin. • The Eye Creme: The Eye Creme is a delightful blend of organic Aloe Vera, wildcrafted Green Tea , organic Licorice, organic Eyebright, Vitamins C & E and organic Oregon Grape to help smooth fine lines and nurture the delicate eye area. For external use only. 2 oz. ORDER TODAY! Ingredients: Organic Herbal Blend, Organic Aloe Vera Leaf Juice, Jojoba Esters, Glycolic Acid, Hydroxyethyl Cellulose, Irish Moss Extract, Cold Pressed Grapeseed Oil, Wildcrafted Green Tea, Organic Licorice, MSM -Methylsulfonylmethane, Organic Evening Primrose Oil, Vitamin C - Sodium Ascorbyl Phosphate, Wildcrafted Eyebright, Oil of Tamanu, Wildcrafted Oregon Grape, Helichrysum Essential Oil, Organic Jojoba Oil, Organic Rosehip Seed Oil, Olive Oil Squalane, Lactic Acid, Isopropyl Palmitate, Kosher Vegetable Glycerin, Cetearyl Alcohol, Cetearyl Glucoside, Sodium Hydroxide, Coenzyme Q10, Phytic Acid,Phospholipids, Tocopheryl (Antioxidant), Lecithin, Pyrus Malus, Limonum, Sugar Cane, Dipeptide Diaminobutyroyl Benzylamide Diacetate, Lemongrass Essential Oil, Butylene Glycol, Vitamin C Palmitate, Acetyl Hexapeptide-3, Sclerotium Gum, Potassium Sorbate, Sodium Benzoate, Xanthan Gum. FACE CARE: The Eye Gel, 0.5 oz. FACE CARE: The Eye Creme, 0.5 oz. • Brightening Luminous Eye Serum: Fruit Stem Cell Complex, Vitamin C, and Goji Glycopeptides help improves collagen and elastin to smooth fine lines and firm dermal texture. Caffeine from green coffee invigorates circulation to reduce puffiness and help diminish dark circles. For external use only. 0.60 oz. ORDER TODAY! Ingredients: Aloe Barbadensis Juice, Vegetable Glycerin, Cetearyl Alcohol, Fruit Stem Cells (Malus Domestsica, Solar Vitis) and BioActive 8 Berry Complex, Camellia Sinensis (Green Tea) and Cucumis Sativus (Cucumber) Extracts, Lycium Barbarum (Goji) Glycopeptide, Lauric Acid, Sodium PCA, Hyaluronic Acid, Magnesium Ascorbyl Phosphate (Vitamin C), Caffeine (Green Coffee), Tocopherol (Vitamin E), Hydrolyzed Soy Protein, Aspalathus Linearis (Rooibos), Hibiscus Sabdariffa and Camellia Sinensis (White Tea) Extracts, Curcuma Longa (Turmeric) and Chamomilla Recutita (Chamomile) Extracts, Laminaria Digitata (Kelp) Extract, Allantoin, Phenethyl Alcohol, Ethylhexylglycerin, Hippophae Rhamnoides (Sea Buckthorn) Oil. • 1000 Roses Eye Revive Contour Gel: Petal-soft to guard delicate eye area, this calming contour gel, with Alpine Rose Stem Cells, glides on smoothly to noticeably reduce fine lines, puffiness, and under-eye circles. Pomegranate, rich in tannins and polyphenols, tones and tightens as moisture-binding Humectants, Hyaluronic Acid, and Aloe Vera revitalize skin's hydro lipid barrier for a naturally perfect complexion. For delicate and dry skin. Dermatologist Tested. For external use only. 2 oz. ORDER TODAY! Ingredients: Aloe Barbadensis Juice, Vegetable Glycerin, Laminaria Digitata (Kelp) Extract, Vaccinium Macrocarpon (Cranberry) Juice, PhytoCellTec (Alpine Rose, Malus Domestsica, Solar Vitis) and BioActive 8 Berry Complex, Soothing Complex: [Hyaluronic Acid, Magnolia Officinalis Bark, Phoenix Dactylifera (Date) Leaf Cell and Boswellia Serrata (Boswellin) Extracts], Panthenol (Pro-Vitamin B5), Allantoin, Rosa Damascena (Rose) Distillate, Mica, Glycine Soja (Soy) Protein, Sodium PCA, Grapeseed Polyphenols, Magnesium Ascorbyl Phosphate (Vitamin C), Rosa Canina (Rosehip) and Punica Granatum (Pomegranate) Extracts, Camellia Sinensis (White Tea) and Aspalathus Linearis (Rooibos) Extracts, Phenethyl Alcohol, Ethylhexylglycerin, Tocopherol (Vitamin E). FACE CARE: Luminous Eye Serum, 0.60 oz. 1000 Roses Eye Revive Contour Gel, 2 oz. • Repair + Renew Smoothing Eye Serum: SOS Smoothing Eye Serum Rosa contains Mosqueta Oil to help smooth "crow's feet" and expression lines, and botanical extracts of Arnica and Calendula to reduce puffiness and dark circles. Euphrasia extract (Eyebright) helps nurture brighter, younger looking skin; and calm and moisturize the skin around the eye area. Helps tone and rejuvenate tired-looking eyes. Suitable for all skin types, especially for: mature/prematurely aged skin, dry skin, blemished skin, uneven skin tone, and environmentally damaged skin. For external use only. 0.5 oz. ORDER TODAY! Ingredients: Aqua (Water), Rosa Canina (Rosehip) Fruit Oil, Cetearyl Alcohol, Glycerin, Caprylyl Glycol, Cetearyl Glucoside, Argania Spinosa (Argan) Kernel Oil, Borago Officinalis (Borage) Seed Oil, Macadamia Ternifolia Seed Oil, Panthenol, Tocopheryl Acetate, Ethylhexylglycerin, Glyceryl Caprylate, Xanthan Gum, Allantoin, Arnica Montana Flower Extract, Niacinamide, Thioctic Acid, Retinyl Palmitate, Tocopherol, Euphrasia Officinalis (Eyebright) Extract, Glyceryl Oleate, Citrus Nobilis (Mandarin Orange) Peel Oil, Helianthus Annuus (Sunflower) Seed Oil, Limonene, Alcohol, Calendula Officinalis Flower Extract, Tussilago Farfara (Coltsfoot) Flower/Leaf Extract, Ascorbyl Palmitate, Fusanus Spicatus (Sandalwood) Oil, Lavandula Angustifolia (Lavender) Oil, Alchemilla Vulgaris (Lady's Mantle) Leaf Extract, Boswellia Carterii (Frankincense) Oil, Rosa Damascena Flower Oil, Citronellol, Linalool, Citric Acid, Pelargonium Graveolens (Geranium) Flower Oil, Phenoxyethanol, Geraniol, Potassium Sorbate, Sorbic Acid. • Natural Eye Nutrients Cream: Natural Eye Nutrients Cream helps fortify and replenish the delicate skin around the eyes. Reverse the signs of aging around the eyes with trillions of VitaminCells that penetrate into the skin and slowly release their powerful age-fighting benefits to smooth out wrinkles. Will not cause breakouts. Recommended for sensitive, rosacea and all skin types. 1 oz. ORDER TODAY! Ingredients: Aloe Vera Barbadensis, Vitamincells: Soy Lecithin Non GMO Liposomes with full-spectrum Vitamin E with Palm Tocopherols & Tocotrienols, Vitamin C Ascorbyl Palmitate, Astaxanthin, Beta-Carotene, Lutein, Lycopene, Zeaxanthin, Coq10; Capriylic Capric Triglycerides, Sunflower Oil Helianthus Anuus, Coconut Oil Cocos Nucifera Oil, Jojoba Oil Simmondsia Chinensis, Vegetable Glycerine, Glyceryl Stearate, Glyceryl Stearate Citrate, Cetyl Alcohol, Hyaluronic Acid (water binder), DMAE, extracts of Elder Sambucus Nigra, Arnica Cordifolia, Horsetail Equisetum Arvense, Chamomile Matricaria Chamomilla; Xanthan Gum, Saccharide Isomerate (water binder), essential oils of Lavender Lavandula Angustifolia, Rosemary Leaf Rosmarinus Officinalis and Geranium Pelargonium Graveolens, Sodium Levulinate, Sodium Anisate, Potassium Sorbate, Sodium Phytate, Xanthan Gum. FACE CARE: Eye Nutrients Cream, 1 oz. • Sea Buckthorn Age Defying Eye Cream: Sea Buckthorn Age Defying Eye Cream is all-natural formula to gently support the delicate skin surrounding your eyes. Made with Sea Buckthorn and Pumpkin Seed to protect and firm skin while refining fine lines and wrinkles. Provides long-lasting hydration and noticeably reduce the appearance of dark circles and puffiness. This botanical (cruciferous) blend will leave the skin around your eyes feeling soft, smooth, and revitalized. For all skin types. For external use only. 0.5 oz. ORDER TODAY! Ingredients: DI Water, Hippophae Rhamnoides (Sea Buckthorn) Seed Oil, Brassica Oleracea Gemmifera (Brussels Sprouts) extract, Brassica Juncea (Mustard) Sprout extract, Brassica Oleracea Italica (Broccoli) Sprout extract, Brassica Oleracea Botrytis (Cauliflower) Sprout extract, Brassica Oleracea Capitata (Cabbage) Sprout extract, Brassica Oleracea Acephala Sprout extract, Wasabi Japonica Root extract, Glycerin, Lecithin, Cetearyl Alcohol, Polyglyceryl-10 Pentastearate, Behenyl Alcohol, Sodium Stearoyl Lactylate, Sodium Levulinate, Sodium Anisate, Hydrolyzed Rice Bran Protein, Glycine Soja (Soybean) Protein, Oxido Reductases, Olea Europaea (Olive) Fruit Unsaponifiables, Meadowfoam Seed Oil, Shea Butter, Sea Water, Cucurbita Pepo (Pumpkin) Seed extract, Hippophae Rhamnoides (Sea Buckthorn) Fruit Oil, Aloe Barbadensis Leaf Juice, Panthenol, Caprylic/Capric Triglyceride, Hyaluronic Acid Powder, Sodium Phytate, Xanthan Gum . • GO Ginger Eye Cream: GO Ginger Eye Cream provides an immediate tightening effect. Made with Argania Spinosa kernel extract to help reduce on fine lines and crow's feet. Over time, wrinkles are dramatically reduced. Organic ginger increases blood flow and help reduce the appearance of under-eye puffiness. Organic Evening Primrose helps calm irritated, inflamed capillaries and redness. Jojoba gently improves the skin's overall moisture balance without clogging pores. 1 oz. ORDER NOW! Ingredients: Water, Coco- Caprylate, Glycerin, Cocoglycerides, Polyglyceryl-6-Distearate, Aloe Barbadensis Leaf Juice, Jojoba/Mimosa/Sunflower Seed Wax Polyglyceryl-3 Esters, Tapioca Starch, Simmondsia Chinensis (Jojoba) Oil, Oenothera Biennis (Evening Primrose) Oil, Persea Gratissima (Avocado) Oil, Camellia Oleifera (Camellia) Oil, Zingiber Officinale (Ginger) Oil, Argania Spinosa Kernel Extract, Zingiber Officinale (Ginger) Extract, Tocopherol, Xanthan Gum, Sodium Cocoyl Glutamate, Gluconolactone, Alcohol, Sodium Benzoate. FACE CARE: Ginger Eye Cream, 1 oz. • Vitamin C Revitalizing Eye Creme: Antioxidant-intensive eye cream smoothes and brightens and provides Photo-Aging Defense. The eye area is always the first to show the signs of aging. To protect eyes from deep wrinkles and dark shadows, the eye area must be treated daily with a richly moisturizing and rejuvenating solution. Antioxidant-rich Vitamin C, Lemon Bioflavonoids and White Tea soothe oxidative stress and help fight the visible signs of photo-aging. Eyes appear refreshed and defined. After cleansing morning and evening, gently smooth cream over the eye area. Perfect for all skin types. pH balanced. 1 oz. ORDER TODAY! Ingredients: Aloe Barbadensis Leaf Juice(1), Aqua (Water), C10-18 Triglycerides, Helianthus Annuus (Sunflower) Seed Oil(1), Polyglyceryl-6 Distearate, Simmondsia Chinensis (Jojoba) Seed Oil(1), Glycerin, Glyceryl Stearate, Cetyl Alcohol, Theobroma Cacao (Cocoa) Seed Butter(1), Borago Officinalis Seed Oil(1), Linum Usitatissimum (Linseed) Seed Oil(1), Prunus Amygdalus Dulcis (Sweet Almond) Oil , Rosa Canina Fruit Oil(1), Arnica Montana Flower Extract(1), Calendula Officinalis Flower Extract(1), Camellia Sinensis Leaf Extract(1), Chamomilla Recutita (Matricaria) Flower Extract(1), Citrus Limon (Lemon) Peel Extract, Lavandula Angustifolia (Lavender) Flower/Leaf/Stem Extract(1), Olea Europaea(Olive) Leaf Extract(1), Algin, Ascorbic Acid, Tocopheryl Acetate, Xanthan Gum, Alcohol(1), Potassium Sorbate, Sodium Benzoate..
FACE CARE: Vitamin C Revitalizing Eye Creme, 1 oz. • Radiance Eye Creme: Radiance Eye Cream is made with Royal Jelly to help improve skin's natural radiance and reduce the appearance of fine lines and wrinkles for skin that appears younger-looking. Formulated with Chamomile and Cucumber to have a comforting and calming effect on the skin. Natural Mica spreads light to help reduce the look of fine lines around the eyes, delivering you the best eye cream for dull skin needing a youthful glow. Dermatologist tested. 0.5 oz. ORDER NOW! Ingredients: Aqua (Water, Eau), Glycerin, Helianthus Annuus (Sunflower) Seed Oil, Cetyl Alcohol, Cetearyl Alcohol, Lanolin, Olea Europaea (Olive) Fruit Oil, Parfum (Fragrance), Coco-Glucoside, Royal Jellyprunus Serotina (Wild Cherry) Bark extract, Aloe Barbadensis Leaf extract, Butyrospermum Parkii (Shea) Butter, Pollen extract, Mentha Viridis (Spearmint) extract, Betula Alba Bark extract Citrus Medica Limonum (Lemon) Peel extract, Arctium Lappa Root extract, Chamomilla Recutita (Matricaria) Flower extract, Cucumis Sativus (Cucumber) Fruit extract, Equisetum Hiemale extract, Euphrasia Officinalis extract Hamamelis Virginiana (Witch Hazel) Leaf extract, Humulus Lupulus (Hops) extract, Pinus Strobus Cone extract, Rosa Canina Fruit extract, Rosmarinus Officinalis (Rosemary) Leaf extract Salvia Officinalis (Sage) Leaf extract, Urtica Dioica (Nettle) extract, Tocopherol, Silica, Titanium Dioxide (CI 77891), Mica (CI 77019), Iron Oxides (CI 77491, 77492, 77499), Xanthan Gum Glycine Soja (Soybean) Oil. • Intense Hydration Eye Cream: Intense Hydration Eye Cream is clinically proven to intensely moisturize dry skin. Helps increase skin's ability to retain moisture and reduces the appearance of lines and wrinkles. Infused with Clary Sage, the lightweight Hydration Eye Cream leaves the delicate skin around your eyes feeling softer than soft. Absorbs quickly with non-greasy formula. Dermatologist Tested and Noncomedogenic. 0.5 oz. ORDER TODAY! • Sensitive Eye Cream: The natural lightweight, fragrance free, Sensitive Eye Cream helps reduce the appearance of under-eye puffiness, and moisturize the delicate eye area without causing redness or irritation. Formulated with softening Cotton Extract to help soften and shield skin from potential irritants. Made with antioxidant-containing White Genepi Extract, tannin-containing Eyebright, Rice Extract hydrates and Aloe calms. Best of all, it's naturally gentle and skin-friendly, so you can use it every day. Giving your sensitive skin the daily care it deserves. Hypoallergenic and Dermatologist tested, Ophthalmologist tested and Allergy tested. 0.5 oz. ORDER TODAY! • Brightening Eye Treatment: Formulated with Daisy extract, Burt's Bees' clinically proven Brightening Eye helps noticeably reduces the appearance of dark spots and decreases the appearance of puffiness, fine lines, and wrinkles. Make it part of your daily regimen for a brighter and more even complexion, naturally. Opthalmologist tested and Dermatologist tested. 0.5 oz. ORDER TODAY! Ingredients: Aqua (Water, Eau), Helianthus Annuus (Sunflower) Seed Oil, Prunus Armeniaca (Apricot) Kernel Oil, Butyrospermum Parkii (Shea) Butter, Olea Europaea (Olive) Fruit Oil, Glyceryl Stearate Citrate, Cetyl Alcohol, Glycerin, Bellis Perennis (Daisy) Flower Extract, Leucojum Aestivum Bulb Extract, Euphrasia Officinalis Extract, Lactobacillus/Dipteryx Odorata Seed Ferment Filtrate, Leuconostoc/Radish Root Ferment Filtrate, Vaccinium Myrtillus Fruit extract, Citrus Medica Limonum (Lemon) Fruit extract, Citrus Aurantium Dulcis (Orange) Fruit extract, Saccharum Officinarum (Sugar Cane) extract, Acer Saccharum (Sugar Maple) extract, Quillaja Saponaria Bark extract, Aesculus Hippocastanum (Horse Chestnut) Seed extract, Emblica Officinalis Fruit Powder, Melissa Officinalis Leaf extract, Vitis Vinifera (Grape) Seed Oil, Aloe Barbadensis Leaf extract, Xanthan Gum, Maltodextrin, Arginine, Alcohol Denat., Alcohol, Phenethyl Alcohol, Parfum (Fragrance), Sodium Benzoate, Phenoxyethanol, Citral, Geraniol, Limonene, Linalool. FACE CARE: Radiance Eye Creme, 2 oz. Intense Hydration Eye Cream, 0.5 oz. FACE CARE: Brightening Eye Treatment, 0.5 oz. FACE CARE: Sensitive Eye Cream, 0.5 oz. • Age Protection Eye Cream: Age Protection Eye Gel is blended with organic Sea Buckthorn Berry extract and Hyaluronic Acid to help reduce the appearance of fine lines and small, dry wrinkles, intensively nourishing the skin around the eyes. 0.51 oz. ORDER TODAY! Ingredients: Aqua (Water), Glycerin, Alcohol, Dehydroxanthan Gum, Algin, Bambusa Vulgaris Extract, Aloe Barbadensis Leaf Juice Powder, Caffeine, Pyrus Cydonia Seed Extract, Euphrasia Officinalis Leaf Extract, Sodium Lactate, Lactic Acid, Parfum (Essential Oils), Limonene, Linalool. FACE CARE: Age Protection Eye Cream, 0.51 oz. • Pomegranate Firming Eye Cream: Renews and reduces puffiness. This antioxidant-rich fragrance-free all natural eye cream with organic pomegranate seed oil protects the delicate eye area from damaging environmental elements. Nourish with nature's ingredients, concentrated in this antioxidant-rich all natural eye cream. Organic macadamia nut oil, organic sunflower petal extract and ruscus root extract (also known as Butcher's Broom) in Weleda Firming Eye Cream boasts anti-inflammatory properties and vitamin A to help firm and smooth skin around the eye. 0.34 oz. ORDER NOW! Ingredients: Water (Aqua), Sesamum Indicum (Sesame) Seed Oil, Alcohol, Simmondsia Chinensis (Jojoba) Seed Oil, Glyceryl Stearate SE, Macadamia Ternifolia Seed Oil, Butyrospermum Parkii (Shea Butter), Triticum Vulgare (Wheat) Germ Oil, Olea Europaea (Olive) Oil Unsaponifiables, Helianthus Annuus (Sunflower) Seed Oil, Punica Granatum (Pomegranate) Seed Oil, Argania Spinosa Kernel Oil, Panicum Miliaceum (Millet) Seed Extract, Ruscus Aculeatus (Butcher's Broom) Root Extract, Helianthus Annuus (Sunflower) Petal Extract, Xanthan Gum. • Wild Rose Smoothing Eye Cream: Wild Rose Smoothing Eye Cream is a concentrated, fragrance-free eye treatment that revives tired eyes, reduces puffiness and the appearance of fine lines. Made with organic Rosehip Seed Oil to restore the delicate skin around the eyes, Eyebright extract, protects from skin-damaging free radicals and environmental influences. Organic Jojoba Seed Oil acts as an emollient to calm and smooth puffy dry skin. Fragrance-free and fast-absorbing, this nurturing, all-natural Wild Rose Smoothing Eye Cream is the secret to fresh bright eyes for the world to see. 0.34 oz. ORDER NOW! Ingredients: Water (Aqua), Prunus Persica (Peach) Kernel Oil, Prunus Amygdalus Dulcis (Sweet Almond) Oil, Alcohol, Simmondsia Chinensis (Jojoba) Seed Oil, Hydrolyzed Beeswax, Rosa Moschata (Rosehip) Seed Oil, Olea Europaea (Olive) Oil Unsaponifiables, Sedum Purpureum (Orpine) Extract, Glyceryl Stearate SE, Euphrasia Officinalis Extract, Xanthan Gum, Sodium Beeswax. • Evening Primrose Age Revitalizing Eye & Lip Cream: Exclusive 2-in-1 Evening Primrose Age Revitalizing Eye & Lip Cream provides line-smoothing strength to the areas around the eyes and lips, helps reduce vertical lines around the mouth. Helps de-puff and define contours around the eyes. Made with Evening Primrose Seed Oil to help in skin renewal, and Gotu-Kola extract, known to increase collagen production. Inca Nut Oil offers antioxidant Vitamin E to protect skin and encourage its revitalization. 0.34 oz. ORDER NOW! Ingredients: Water (Aqua), Helianthus Annuus (Sunflower), Alcohol, Simmondsia Chinensis (Jojoba), Macadamia Ternifolia, Glyceryl Stearate, Glycerin, Olea Europaea (Olive), Theobroma Cacao (Cocoa), Beeswax (Cera Flava), Organic Plucenetia Volubilis Oil (Inca Nut Oil), Hamamelis Virginiana (Witch Hazel), Oenothera Biennis (Evening Primrose), Centella Asiatica Extract (Gotu-kola), Althaea Officinalis (White Mallow), Acacia Gum, Xanthan Gum, Lactic Acid, Glyceryl Caprylate, Sucrose (Sugar). FACE CARE: Pomergranate Firming Eye Cream, 0.34 oz. FACE CARE: Wild Rose Smoothing Eye Cream, 0.34 oz. FACE CARE: Evening Primrose Age Revitalizing Eye & Lip Cream, 0.34 oz. • Evenly Radiant Dark Circle Eye Creme:Reduce the look of dark circles, fine lines, wrinkles and puffiness with the skin-brightening Dark Circle Eye Creme. Blended with the Intensive Skin Brightening Complex, Madonna Lily Plant Stem Cells, Bearberry, Niacinamide, Licorice and Green Tea to help fight discoloration for a more evenly toned, luminous eye area. Supplemented with Pycnogenol®, Horse Chestnut and Yarrow to help reduce dark circles caused by poor circulation. Suitable for all skin types experiencing tired, dark-circled eyes, Dark Circle Eye Creme brighten the entire eye area to appear clearer, well rested and radiant. 0.5 oz. ORDER TODAY! Ingredients: Water (Aqua), Glycerin, Propanediol, Capric/Caprylic Triglyceride, Niacinamide (Vitamin B3), Cetearyl Olivate, Sorbitan Olivate, Glyceryl Stearate SE, Cetyl Alcohol, Xanthan Gum, Pinus Pinaster (Pycnogenol®) Bark Extract, Sodium Hyaluronate (Hyaluronic Acid; Actimoist® Bio-1), Tocopheryl Acetate (Vitamin E), Retinyl Palmitate (Vitamin A), Achillea Millefolium (Yarrow) Extract, Hamamelis Virginiana (Witch Hazel) Extract, Epilobium Angustifolium (Canadian Willowherb™) Extract, Lilium Candidum (Madonna Lily) Leaf Cell Extract, Arctostaphylos Uva Ursi (Bearberry) Leaf Extract, Prunus Persica (Peach) Kernel Extract, Aesculus Hippocastanum (Horse Chestnut) Seed Extract, Organic Camellia Sinensis (Green Tea) Leaf Extract* (2.0%), Caffeine, Arnica Montana Flower Extract, Glyceryl Stearate Citrate, Triethoxycaprylylsilane Zinc Oxide, Zinc Oxide, Potassium Sorbate, Potassium Cetyl Phosphate, Phenoxyethanol, Ethylhexylglycerin. • Deep Wrinkle Peptide Eye Creme:Noticeably smooth the appearance of even the deepest lines, wrinkles and crow's feet with Deep Wrinkle Peptide Eye Creme. Peptide Matrixyl® synthe'6® imparts the skin to produce new key elements such as collagen and to restructure itself. Peptide Argireline® helps relax facial muscles, smooth wrinkles, and discourage the formation of new lines. Supplemented with antioxidants Green Tea and Pycnogenol®, helps defend, calm and reduce signs of aging for more youthful, radiant eyes. 0.5 oz. ORDER TODAY! Ingredients: Purified Water (Aqua), Glycerin, Caprylic/Capric Triglyceride, Macadamia Ternifolia Seed Oil, Stearic Acid, Cetyl Alcohol, Glyceryl Stearate, Hydroxypropyl Cyclodextrin, Palmitoyl Tripeptide-38 (Matrixyl synthe'6®), Acetyl Hexapeptide-8 (Argireline®), Panthenol (Provitamin B5), Pinus Pinaster (Pycnogenol®) Bark Extract, Tocopheryl Acetate (Vitamin E), Retinyl Palmitate (Vitamin A), Hamamelis Virginiana (Witch Hazel) Extract, Aesculus Hippocastanum (Horse Chestnut) Seed Extract, Organic Camellia Sinensis (Green Tea) Leaf Extract (.1%), Organic Chamomilla Recutita (Matricaria) Flower Extract (.1%), Organic Simmondsia Chinensis (Jojoba) Seed Oil (.1%), Allantoin, Dimethicone, Xanthan Gum, Zinc Oxide, Potassium Sorbate, Phenoxyethanol, Ethylhexylglycerin. • Soothing Eye Gel w/Pycnogenol:Visibly reduce fine lines, wrinkles, crow's feet and under-eye puffiness with this cooling, fragrance-free Soothing Eye Gel for sensitive skin around the eyes. Formulated with anti-aging Pycnogenol®, Green Tea, skin-tightening Witch Hazel and calming Aloe. 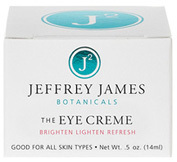 Perfect for those with easily irritated or puffy eyes seeking a soothing yet invigorating anti-aging eye moisturizer. 0.5 oz. ORDER TODAY! Ingredients: Water (Aqua), Hamamelis Virginiana (Witch Hazel) Extract, Pinus Pinaster (Pycnogenol®) Bark Extract, Allantoin, Glycerin, Panthenol, Carbomer, Organic Camellia Sinensis (Green Tea) Leaf Extract (.1%), Organic Aloe Barbadensis Leaf Extract (.1%), Beta-Alanine, Phenoxyethanol, Ethylhexylglycerin. • Firming DMAE Eye Lift: Noticeably lift, firm and tighten the delicate eye area, smoothing crow's feet with this doctor-developed, multi-action Firming DMAE Eye Lift. Made with DMAE, a widely- renowned skin-firming nutrient to increase collagen for firmer, more resilient skin. InstaLift® Goji Berry glycopeptides add further firming, lifting and tightening antioxidant power. Advanced peptides Argireline® and Matrixyl® synthe'6® are blended to soften facial muscles and combine Collagen to help smooth wrinkles and prevent new lines from forming. Hyaluronic Acid helps infuse a flow of cooling eye moisture for a soft, smooth, toned and rehydrated skin. With continuous use, this pro-collagen and pro-elastin combination leaves the delicate eye area firmer, smoother and younger-looking. 0.5 oz. ORDER TODAY! Ingredients: Purified Water (Aqua), Caprylic/Capric Triglyceride, Niacinamide (Vitamin B3), Coco-Caprylate, Stearyl Alcohol, Glycerin, Propanediol (Zemea®), Lycium Barbarum (Instalift® Goji) Fruit Extract, Glyceryl Stearate, Hamamelis Virginiana (Witch Hazel) Extract, Diheptyl Succinate, Capryloyl Glycerin/Sebacic Acid Copolymer, Copernicia Cerifera (Carnauba) Wax, Dimethyl MEA (DMAE), Palmitoyl Tripeptide-38 (Matrixyl® synthe'6®), Acetyl Hexapeptide-8 (Argireline®), Sodium Hyaluronate (Hyaluronic Acid; Actimoist®Bio-1), Thioctic (Alpha-Lipoic) Acid, Panthenol (Provitamin B5), Sodium Ascorbyl Phosphate (Vitamin C, Stay-C® 50), Organic Simmondsia Chinensis (Jojoba) Seed Oil (.1%), Caffeine, Hydroxypropyl Cyclodextrin, Allantoin, Xanthan Gum, Glyceryl Stearate Citrate, Phenoxyethanol, Ethylhexylglycerin. FACE CARE: Evenly Radiant Dark Circle Eye Creme, 0.5 oz. Deep Wrinkle Peptide Eye Creme, 0.5 oz. FACE CARE: Firming DMAE Eye Lift, 0.5 oz. FACE CARE: Soothing Eye Gel w/Pycnogenol, 0.5 oz. 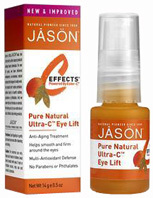 • Ultra-C Eye Lift: C-Effects Ultra-C Eye Lift provide your eyes the lift you've been looking for.This exclusive, multi-antioxidant complex of Ester-C®, Vitamin C, Thioctic Acid, Vitamin E and Green Tea nurtures the sensitive skin around your eyes. Helps protect it against skin-aging free radicals that can cause premature aging, fine lines and wrinkles. With use, eyes appear more alert and youthful while skin feels soft and smooth. 0.5 oz. ORDER TODAY! Ingredients: Purified Soft Water, Vegetable Glycerin, Orange Extract, Ascorbic Acid(Vitamin C), Oleth-20, Ester-CTM, Tocopherol(Vitamin E), Sodium Hyaluronate, Aloe Vera Gel, Dimethicone Copolyol, Rose Hips Extract(Vitamin C), Eye Brite Extract, Hydroxyethylcellulose, Green Tea Extract, Polysorbate-20, Alpha Lipoic Acid, Methylparaben, Propylparaben, Natural Color, Grapefruit Extract, Natural Fragrance. • Renewing & Cooling Eye Treatment Cream: Revitalize tired eyes with the fast-absorbing, nutrient-rich Renewing & Cooling Eye Treatment. Made with Avocado Oil to intensely nurture the sensitive skin around the eye, and Moroccan Argan Oil, helps replenish the skin. Advanced formula and novel cooling applicator reduces puffiness and dark circles. Ideal for normal to dry skin. 0.5 oz. ORDER TODAY! Ingredients: Organic Aloe Barbadensis Leaf (Aloe Vera) Juice, Organic Butyrospermum Parkii (Shea) Butter, Autolyzed Yeast, Organic Helianthus Annuus (Sunflower) Seed Oil, Organic Glycerin, Organic Oryza Sativa (Rice) Bran Extract, Xanthan Gum, Organic Argania Spinosa (Argan) Oil, Organic Soy Lecithin, Organic Theobroma Grandiflorum (Cupuacu) Butter, Organic Rosa Canina (Rosehip) Seed Oil, Organic Rosa Damascena (Rose) Flower Distillate, Organic Persea Gratissima (Avocado) Oil, Organic Zea Mays (Corn) Starch, Organic Hamamelis Virginiana (Witch Hazel) Distillate, Tocopherol (Vitamin E), Ascorbic Acid (Vitamin C). FACE CARE: Renewing & Cooling Eye Treatment Cream, 0.5 oz. • Borage Therapy Eye Cream: Borage oil helps repair and rebuild skin. Soothes puffy eyes and tightens fine lines. Rich, calm, gentle. 0.5 oz. ORDER TODAY! Ingredients: Water (Aqua), Borage (Borago Officinalis) Oil, Jojoba (Simmondsia Chinensis) Seed Oil, Glycerine, Glyceryl Stearate SE, Shea Butter (Butyrospermum Parkii Fruit), natural Vitamin E Acetate (Tocopherol Acetate), Cucumber (Cucumis Sativus) Extract, Cetyl Alcohol, Cyclomethicone, Phenoxyethanol, Stearyl Glycyrrhetinate (Licorice Root extract), Diazolidinyl Urea and Ethylhexylglycerin. FACE CARE: Borage Therapy Eye Cream, 0.5 oz. • Under Eye Dark Circle Serum: Hemoglobin leakage, newly discovered as a major cause of severe dark circles, is now treated with this breakthrough formula. Under-eye area can now look lighter, brighter and clearer. 1 oz. ORDER TODAY! Ingredients: Demineralized Spring Water, DMAE Bitartrate, Glycerin (Veg. ), Palmitoyl Oligopeptide, Palmitoyl Tetrapeptide-3, Hydroxysuccinamide, Chrysin, Polysorbate-20, Mulberry Extract, Hyaluronic Acid, Steareth-20, Hydrolyzed Soy Protein, Magnesium Ascorbyl Phosphate, Hydroxyethylcellulose, Simethicone, Potassium Sorbate, Sodium Benzoate, Citric Acid. • DMAE & Alpha Lipoic Acid & Vitamin C Ester Firming Eye Serum: Formulated with DMAE, Alpha Lipoic Acid and Wheat Protein to help firm and fight bags, diminish appearance of eye area wrinkles, and puffiness. Alpha Lipoic Acid and Vitamin C Ester antioxidants help protect against future skin damage. Mulberry and Lime help lighten dark circles. Hyaluronic Acid and Allantoin, in an exclusive blending hydrate and smooth area. 1 oz. ORDER TODAY! Ingredients: Demineralized spring water, Olive Oil, Cyclomethicone, Whole Wheat Protein, DMAE Bitartrate, Mulberry Extract, Lime Extract,Alpha Lipoic Acid, Ascorbyl Palmitate, Hyaluronic Acid, Allantoin, Xanthan Gum, Cetearyl Alcohol, Ceteareth 20, Potassium Sorbate, Sodium Benzoate, Citric Acid. • Eye Complex Firming Cream: This delicate eye area cream is blended with an herbal complex for firming, plant extracts to improve circulation and vegetable oils to aid dryness. 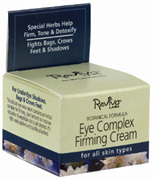 Eye Complex Firming Cream helps restore areas of Under-Eye Shadows, Bags and Crows Feet. Its light, easily applied and quickly absorbed. 0.75 oz. ORDER TODAY! Ingredients: Demineralized Spring Water, Whole Wheat Protein, Compound of Red Vine, St. John's Wort, Arnica, Witch Hazel, Horse chestnut, Ivy, Wheat Germ Oil, Sweet Almond Oil, Calendula Oil, Carbomer 934, Castor Oil, Cornflower Extract, Methyl Paraben, Propyl Paraben, Essential Oil. • Myoxinol Infused Collagen Fiber Eye Pads: Collagen-Fibre with Myoxinol combines moisturization and wrinkle relaxing action. The Collagen instantly plumps and softens skin while Myoxinol calms an underlying cause of wrinkles by relaxing facial muscles for a smoother, younger appearance. Quickly improve your under-eye area with Collagen-Fibre with Myoxinol®. Reviva's 100% pure freeze dried Collagen-Fibre has been a salon staple for years. This guarded secret is used to provide quick improvements to your eye area by: reducing wrinkles, decreasing puffiness, and diminishing dark circles. Contains: Collagen Fibre Eye Pads (3 pairs). ORDER TODAY! Ingredients: 100% Pure Medical Grade Collagen Fibre, Myoxinol® (Hibiscus Flower Extract). NOTE: No preservatives are necessary because no bacteria can grow on this freeze-dried pad and because the pad is discarded after one use. FACE CARE: Under Eye Dark Circle Serum, 1 oz. FACE CARE: Firming Eye Serum, 1 oz. FACE CARE: Eye Complex Firming Cream, 0.75 oz. • Eyewitness Eye Repair Creme: Diminish the appearance of fine lines, dark circles and puffiness with potent natural and organic ingredients. Smooth the appearance of wrinkles and hydrate the delicate skin around your eyes. Natural and organic oils and butters leave skin looking moisturized and revitalized. 0.5 oz. ORDER TODAY! Ingredients: Aloe Barbadensis (Aloe Leaf Extract/Extrait de feuille d'aloe), Glycine Soja (Soybean Oil/Huile de soja), Helianthus Annuus (Sunflower Oil/Huile de tournesol), Cetearyl Glucoside, Glyceryl Stearate, Olea Europaea (Olive Oil/Huile d'olive), Glycerin, Butyrospermum Parkii (Shea Butter/Beurre de karite), Xanthan Gum, Anthemis Nobilis (Chamomile Flower/Fleur de camomille)*, Euphrasia Officinalis (Eyebright Extract/Extrait d'eyebright), Crataegus Laevigata (Hawthorne Berry Extract/ Extrait de baie de hawthorne), Equisetem Arvense (Horsetail Leaf Extract/Extrait de prele), Echinacea Angustifolia (Leaf Extract/ Extrait de feuile), Rosa Canina (Rose Hips Fruit Extract/Extrait de fruit de gratte-culs), Cymbopogon Schoenanthus (Lemongrass Leaf Extract/Extrait de fuille), Tocopherol, Caprylic Acid, Retinyl Palmitate, Bisabolol, Ascorbyl Phosphate, Hyaluronic Acid, Glycine, Alpha Lipoic Acid, Ascorbyl Palmitate, Lavandula Angustifolia (Lavender Oil/Huile de lavande), Potassium Sorbate. • Look Alive Eye Gel: The refreshing Look Alive Eye Gel is no simple moisturizer. Cucumber extract cools, depuffs and fights dark circles—so you see the world through fresh eyes. It's the perfect quick fix for eyes, under or over makeup. Immediately, natural peptides and antioxidants target under eye issues—firming, brightening, and revitalizing your outlook. For external use only. 0.5 oz. ORDER TODAY! Ingredients: Purified Water, Aloe barbadensis (Aloe Vera) leaf juice, Glycerin, Hyaluronic acid, Sodium Pca, Panthenol, Allantoin, Soy Protein, Myrtus Communis (myrtle) Extract, Fagus Silvatica (beech Tree) Bud Extract, Tetrahydropiperine (black Pepper), Cocos Nucifera (coconut) Extract, Aesculus Hippocastanum (horse Chestnut) Seed Extract, Emblica Officinallis (amla) Fruit Extract, Saccharum Officinarum (sugarcane) Extract, Roman Anthernis Nobilis (chamomile) Flower Water, Camellia (green Tea) Sinensis Leaf Extract, Cucumis Sativus (cucumber) Fruit Extract, Magnesium Ascorbyl Phosphate, Xanthan Gum, Algin, Hydroxyethyl Cellulose, Phenoxyethanol, Ethylhexylglycerin. Fragrance-free. FACE CARE: Look Alive Eye Gel, 0.5 oz. • Active Age Defense Cellagen Renewal Serum: A superior combination of nature's rarest and most effective super moisturizers and bio-hydrators that instantly smooth out the appearance of wrinkles and fine lines. Made with Hyaluronic Acid, which delivers noticeably fresher, firmer and more youthful-looking skin. Even stubborn lines around the eyes are softened. Blended with Retinyl Palmitate to promote constant revitalization. 1 oz. ORDER TODAY! Ingredients: Aqua (Water), Glycerin, Panax Ginseng Root Extract, Tocopherol, Sodium Hyaluronate, Beta-Carotene, Rubus Idaeus (Raspberry) Fruit Extract, Glycyrrhiza Glabra (Licorice) Root Extract, Aesculus Hippocastanum (Horse Chestnut) Seed Extract, Retinyl Palmitate, Panthenol, Allantoin, Ascorbic Acid, Lactic Acid, Citrus Grandis (Grapefruit) Fruit Extract, Lonicera Caprifolium (Honeysuckle) Flower Extract, Lonicera Japonica (Honeysuckle) Flower Extract, Hamamelis Virginiana (Witch Hazel) Extract, Hydroxyethylcellulose, Polysorbate 20, Phenoxyethanol, Fragrance (Parfum). • Azulene Eye Treatment: A highly effective formula designed exclusively for the delicate eye area. The distinctive Blue Chamomile Flower extract helps to reduce the look of puffiness and dark circles, while rich moisturizers soften and reduce the appearance of fine lines. Gluten-free. 1 oz. ORDER TODAY! Ingredients: Aqua (Water), Macadamia Ternifolia Seed Oil, Glycerin, Simmondsia Chinensis (Jojoba) Seed Oil, Carthamus Tinctorius (Safflower) Seed Oil, Cetyl Alcohol, Cetearyl Alcohol, Butyrospermum Parkii (Shea Butter), Stearic Acid, Cetearyl Glucoside, Lonicera Japonica (Honeysuckle) Flower Extract, Niacinamide, Limnanthes Alba (Meadowfoam) Seed Oil, Cera Alba (Beeswax), Lonicera Caprifolium (Honeysuckle) Flower Extract, Allantoin, Potassium Sorbate, Xanthan Gum, Citrullus Vulgaris (Watermelon) Fruit Extract, Pyrus Malus (Apple) Fruit Extract, Lens Esculenta (Lentil) Fruit Extract, Sodium PCA, Sodium Lactate, Cola Acuminata Seed Extract, Azulene, Vaccinium Myrtillus (Bilberry) Fruit Extract, Saccharum Officinarum (Sugar Cane) Extract, Acer Saccharum (Sugar Maple) Extract, Citrus Aurantium Dulcis (Orange) Fruit Extract, Citrus Medica Limonum (Lemon) Fruit Extract, Citrus Nobilis (Mandarin Orange) Peel Oil, Citrus Aurantium Dulcis (Orange) Peel Oil, Citrus Aurantifolia (Lime) Oil, Prunus Amygdalus Amara (Bitter Almond) Kernel Oil, Barosma Betulina Leaf/Twig Extract, Hydrogenated Soybean Oil. FACE CARE: Cellagen Renewal Serum, 1 oz. FACE CARE: Azulene Eye Treatment, 1 oz. • Hawaiian Eye Gel: Allow tired eyes wake up with this feel-good, invigorating gel. Calming Aloe and Green Tea antioxidants help soothe puffiness. Cucumber, Chamomile and Kelp extracts help firm and tone for a look that's wide awake and refreshed. Hypo-allergenic. 1 oz. ORDER TODAY! Ingredients: qua (Water), Aloe Barbadensis Leaf Juice(1), Glycerin, Camellia Sinensis Leaf Extract(1), Cucumis Sativus (Cucumber) Fruit Extract, Carica Papaya (Papaya) Fruit Extract, Chamomilla Recutita (Matricaria) Flower Extract, Laminaria Digitata Extract, Spirulina Maxima Extract, Zingiber Zerumbet Extract, Allantoin, Hyaluronic Acid, Hydrolyzed Soy Protein, Magnesium Ascorbyl Phosphate, Panthenol, Riboflavin, Sodium Carbomer, Ethylhexylglycerin, Phenoxyethanol. FACE CARE: Hawaiian Eye Gel, 1 oz. • Azulene Eye Elixir: A thorough time-released eye reparative cream helps noticeably reduce the ever-deepening network of lines and the appearance of exhaustion and discoloration caused by sun exposure, smoking, squinting and pollution. Made with extracts of Eyebright, Green Tea, Ginkgo, and Grape Seed calm and protect the sensitive area while the time-released Vitamin Liposome Complex provides constant antioxidant protection to help fight cellular aging. 0.5 oz. ORDER NOW! Ingredients: Deionized Water, Eyebright Extract, Vegetable Glycerin, Sea Algae Extract, German Blue Chamomile Azulene, Vitamin Liposome Complex of d-Alpha Tocopherol (Vitamin E), Retinyl Palmitate (Vitamin A), Panthenol (Pro-vitamin B5), and Sodium PCA, Herbal Liposome Complex of Green Tea, Ginkgo Biloba, Grape Seed, Locust Bean Gum and Fruit Sorbitol, Soy Protein, Essential Oils of Chamomile and Olibanum, Xanthan Gum, Methylparaben and Propylparaben. FACE CARE: Azulene Eye Elixir, 0.5 oz. • Apricot Eye Therapy: Tighten, revitalize and fortify delicate under eye skin with Apricot Eye Therapy. Made with Apricot, Ginger and Cardamom to help calm and replenish delicate skin around the eyes. Soothing Sweet Almond oil softens the skin while refreshing Lemon acts to firm and tone. Suitable for all skin types. Used after a late night out, this lightweight eye treatment produces visible results immediately. pH balanced. For external use only. 0.5 oz. ORDER TODAY! Ingredients: Purified Water, aqueous extracts of Lemon (Citrus Limon), Apricot Kernel Oil (Prunus Ameriaca), Apricot Fruit extract (Prunus Ameriaca), Oils of Sunflower (Helianthus Anuus), Sweet Almond (Prunus Dulcis), and Apricot, extracts of Cardamom (Elettaria Fragrance. Cardamomum) and Ginger (Zingiber Officinale), Glyceryl Stearate, Emulsifying Wax, Glycerine, Potassium Hydroxide, Phenoxyethanol, Sodium Benzoate. FACE CARE: Apricot Eye Therapy, 0.5 oz. Ingredients: Aqua (Water), Glycerin, Ehtylhexyl Stearate, Persea Gratissima (Avocado) Oil, Cetearyl Alcohol, Cucumis Sativus (Cucumber) Seed Oil, Pfaffia Paniculata Root Extract, Ptychopetalum Olacoides Bark/Stem Extract, Borago Officinalis Seed Oil, Panicum Miliaceum (Millet) Seed Extract, Lilium Candidum Flower Extract, Sodium Stearoyl Glutamate, Benzoic Acid, Xanthan Gum, Tannic Acid, Pentaerythrityl Distearate, Caprylyl/Capryl Glucoside, Sodium Polyacrylate, Dehydroacetic Acid, Ethylhexylglycerin, Benzyl Alcohol, Potassium Sorbate, Phenoxyethanol. • Grape Seed Eye Cream:Made with antioxidant-rich Grape Seed helps treat for the delicate skin around the eyes. Formulated with Alfalfa and Lupine to help reduce the appearance of under-eye bags, and Cassava extract boosts firmer feeling and smoother looking skin. Natural Oat sugars help smooth skin and decrease the appearance of fine lines and wrinkles. Tired eyes are relaxed, moisturized and revitalized, showing a healthy, youthful looking skin. For external use only. 1 oz. ORDER TODAY! Ingredients: Water, Caprylic/Capric Triglyceride, Glycerin, Cetyl Alcohol, Microcrystalline Cellulose, Acacia Decurrens/Jojoba/Sunflower Seed Wax Polyglyceryl-3 Esters, Squalane, Glyceryl Stearate SE, Sucrose Palmitate, Hydrolyzed Lupine Protein, Medicago Sativa (Alfalfa) Seed Extract, Vitis Vinifera (Grape) Seed Oil, Vitis Vinifera (Grape) Seed Extract, Hydrolyzed Manihot Esculenta Tuber (Cassava) Extract, Avena Sativa (Oat) Kernel Extract, Aloe Barbadensis Leaf Juice, Camellia Sinensis (White Tea) Leaf Extract, Rubus Villosus (Blackberry) Fruit Extract, Argania Spinosa (Argan) Kernel Extract, Linum Usitatissimum (Linseed/Flaxseed) Seed Extract, Olea Europaea (Olive) Fruit Unsaponifiables, Malpighia Glabra (Acerola) Fruit Extract, Xanthan Gum, Cellulose Gum, Ethylhexylglycerin, Phenoxyethanol. FACE CARE: Grape Seed Eye Cream, 1 oz. • Camellia Eye Cream: A rich moisturizer for reducing signs of aging, such as wrinkles, dryness and puffiness around the eyes. For external use only. 0.5 oz. ORDER TODAY! Ingredients: Oils of Olive, Coconut, Camellia, Borage, Evening Primrose, Organic Rosa Mosqueta, Sea Buckthorn, Jojoba & Aloe Vera, Shealoe Butter, Berry Wax, Alkanet, Organic Ashwaganda, Rose, Comfrey, Neem & Fennel, Grapefruit Seed Extract & Essential Oils. • Nourishing Eye Gel: Nourishing Eye Gel is a light, oil-free, hydrating gel that nourishes and guards the delicate eye area from dehydration and signs of aging. This time-release formula blends powerful anti-oxidants, replenishing moisturizers, and finest botanicals to help reduce the impact on the appearance of the skin due to sun and environmental damage. Use regularly for best results. 1 oz. ORDER TODAY! Ingredients: Purified Water, Glycerin, Aloe Barbadensis (Aloe Vera) Leaf Juice, Cucumis Sativus (Cucumber) extract, Camellia Sinensis (Green Tea) extract, Anthemis Nobilis (Chamomile) extract, Camellia Sinensis (White Tea) extract, Calendula Officinalis (Calendula) extract, Magnesium Ascorbyl Phosphate, Lavandula Angustifolia (Lavender) Hydrosol, Ginkgo Biloba (Ginkgo) Extract, Soy Protein, Hyaluronic Acid, Sodium Carbomer, Algin, Superoxide Dismutase, Ergocalciferol, Panthenol, Allantoin, Phenoxyethanol, Ethyl Hexyl Glycerin. • Extra Gentle Eye Make-up Remover:Extra Gentle Eye MakeUp Remover with an herbal extract and vegetable Glycerin gently removes all types of makeup, including water-resistant, completely and easily without irritation. Leaves no oily residue. Makeup can be re-applied immediately after use. 4 oz. ORDER TODAY! Ingredients: Purified Water, Vegetable Glycerine, Decyl Glucoside, Hamamelis Virginiana (Witch Hazel) Extract, Cocamidopropyl Betaine, Phenoxyethanol, Ethyl Hexyl Glycerin. FACE CARE: Nourishing Eye Gel, 1 oz. FACE CARE: Eye Make-up Remover Extra Gentle, 4 oz. • Eyewitness Eye Repair Creme: Reduce the appearance of fine lines, dark circles and puffiness with potent natural and organic ingredients. Smooth the appearance of wrinkles and moisturize the delicate skin around your eyes. Natural and organic oils and butters leave skin looking hydrated and rejuvenated. Includes Essential Fatty Acids, Alpha Lipoic Acid, antioxidant Vitamins A, C and E, and soothing Shea Butter. Firm, plump, and organically regenerate skin daily for a healthy, youthful appearance in the important eye area. 0.5 oz. ORDER TODAY! Ingredients: Certified Organic Floral Water of Chamomil, Eyebright, Hawthorne, Steam Distilled Water, Infusion of Organic Herbs of Horsetail, Echinacea, Rose Hips& Lemongrass, Certified Organic Soy Oil, Certified Organic Sunflower Oil, Meadowfoam Oil, Cetearyl Glucoside, Glyceryl Stearate, Certified Organic Olive Oil, Vegetable Glycerine, Shea Butter, Xanthan Gum, Tocopherol, Caprylic Acid, Glycine, Bisabolol, Alpha Lipoic Acid, Ascorbyl Palmitate, Hyaluronic Acid, Lavender Oil. FACE CARE: Eyewitness Eye Repair Creme, 0.5 oz. • Allergy & Red Eye Relief: For temporary relief of eye symptoms related with allergies, hay fever, irritations or overuse: dryness, redness, itching, burning, swollen, inflamed, watery, sensitive. 2 oz. ORDER TODAY! Ingredients: Aconitum napellus, Allium cepa, Ambrosia artemisiaefolia, Apis mellifica, Arsenicum album, Belladonna, Cactus grandiflorus, Dulcamara, Euphrasia officinalis, Gelsemium sempervirens, Graphites, Hamamelis virginiana, Hepar sulphuris calcareum, Kali iodatum, Mercurius vivus, Natrum muriaticum, Pulsatilla, Rhus toxicodendron, Ruta graveolens, Sabadilla, Sulphur, Thuja occidentalis, Zincum metallicum. FACE CARE: Allergy & Red Eye Relief, 2 oz. 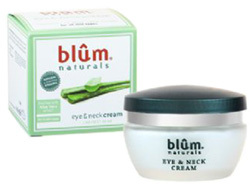 • Eye & Neck Cream: Eye & Neck Cream helps prevent crow's feet and reduce puffiness while hydrating. The active ingredients smooth away signs of skin aging with triple firming action; moisturizing, wrinkle-correction and rejuvenation. Made with Aloe Vera Extract is rich in vitamins and minerals. 1.69 oz. ORDER TODAY! Ingredients: Aloe Barbadensis (Aloe Vera) Leaf Juice , Glyceryl Stearate SE, Cetyl Alcohol, Caprylic/Capric Triglyceride, Decyl Oleate, Propanediol, Glycerin, Cetearyl Alcohol, Isoamyl Laurate, Dipalmitoyl Hydroxyproline, Plukenetia Volubilis Seed Oil (Inca Inchi Oil), Butyrospermum Parkii (Shea Butter), Squalane, Saccaride Isomerate, Simmondsia Chinensis (Jojoba) Seed Oil, Olea Eurapaea (Olive) Fruit Oil, Tocopheryl Acetate (Vitamin E), Sodium Hyaluronate , Sodium Stearoyl Glutamate, Glyceryl Caprylate, Parfum (Fragrance), Aqua (Water) P-Anisic Acid, Benzyl Alcohol, Benzoic Acid. May Contain: Citronellol, Geraniol, Limonene, Linalool. FACE CARE: Eye & Neck Cream, 1.69 oz. • FAST FIX for Puffy Eyes: When you need a fast fix for tired, puffy eyes, the cooling FAST FIX for Puffy Eyes instantly recovers the eyes while Cucumber, Green Tea and Caffeine help invigorate, revitalize and reduce puffiness. What a wake-up call! Hypo-allergenic. 0.25 oz. ORDER TODAY! Ingredients: Aqua (Purified Water), Glycerin, Aloe Barbadensis Leaf Juice, Sorbitol, Camellia Sinensis Leaf Extract, Cucumis Sativus (Cucumber) Fruit Extract, Tocopheryl Acetate, Beta-Glucan, Algin, Caffeine, Menthol, Sodium Hyaluronate, Sodium Phytate, Xanthan gum, Benzoic Acid, Benzyl Alcohol, Potassium Sorbate, Sodium Benzoate, Sorbic Acid. • FAST FIX for Undereye Circles: When you need a fast fix for under eye circles, the vanishing yellow concealer FAST FIX for Undereye Circles, helps neutralize darkness to brighten tired eyes. Made with Apple Fruit, White Lily and Caffeine help maintain even tone from below the surface. It's magical brightening in a blink! Hypo-allergenic. 0.25 oz. ORDER TODAY! Ingredients: Aqua (Purified Water), Isoamyl Laurate, Titanium Dioxide (CI 77891), Caprylic/Capric Triglyceride , Glyceryl Stearate SE, Stearyl Alcohol, Cetyl Alcohol, Sorbitol, Iron Oxides (CI77492), Glycyrrhiza Glabra (Licorice) Root Extract, Pancratium Maritimum Extract, Pyrus Malus (Apple) Extract, Alcohol, Alumina, Caffeine, Citric Acid, Glycerin, Jojoba Esters, Silica, Benzyl Alcohol, Potassium Sorbate, Sodium Benzoate, Iron Oxides (CI 77491). FACE CARE: FAST FIX, 0.25 oz.